If you were at Turkey on the Run on Thanksgiving Day in Wenatchee, you most likely saw Scott Kabrich of San Antonio, Texas. 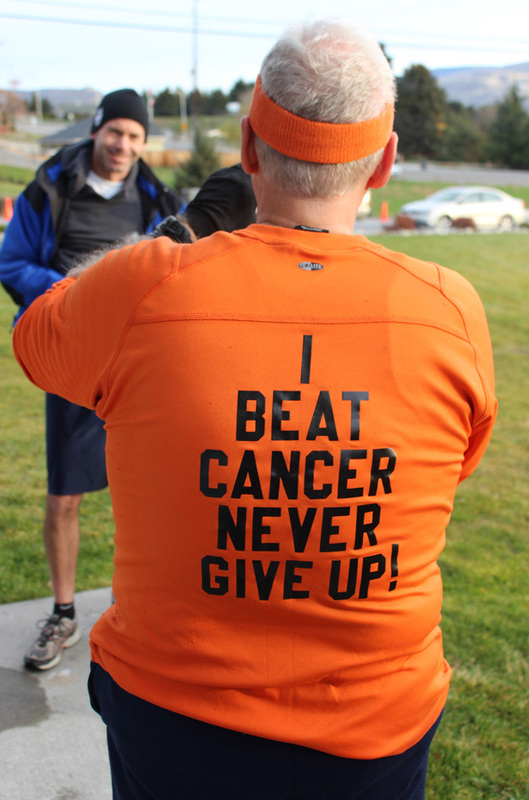 He was hard to miss in his bright orange shirt, even more so with the words, “I beat cancer. Never give up!,” stamped on the back. Scott Kabrich — a.k.a. Scottydog — takes a photo of Turkey on the Run participants at Rotary Park in Wenatchee on Nov. 22. Kabrich was in Wenatchee with his wife, Gail, to visit his in-laws for the holiday. 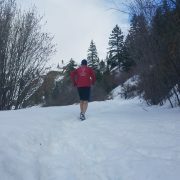 And that opened up an opportunity for the avid runner and walker to do RunWenatchee’s Turkey on the Run, which in turn provided fodder for the “photo race reports” he does for Runner’s World around the country. In his blog, the cancer survivor goes by the pen name of Scottydog, a take on his penchant for handing out dog biscuits to the four-legged variety he meets on his jaunts. He posts tons of photos, of course. Because of spinal arthritis, he no longer runs an entire event but instead employs the run-walk method. That allows him to tote along his camera and shoot away whenever he wishes. “I’m on what I call the ‘2F Plan,’ which stands for Fun and Finish,” Kabrich writes with good-natured humor. Of his visit here, Kabrich writes of participating in Turkey on the Run as well as taking jaunts on his own in the Wenatchee Foothills, along the Apple Capital Recreation Loop Trail, and in Cashmere. He came away impressed with the loop trail, finding it similar in ways to San Antonio’s famed River Walk. In Cashmere, he wished the riverfront trail was longer (don’t we all!) but loved the river views. And when he visited Saddle Rock, he ran into our friend, Charlie Naismith, who gave him the “low-down” on all the Chelan-Douglas Land Trust doings in the foothills. Way to go, Charlie! Again, check out Scottydog’s blog here. He took so many photos that if you did Turkey on the Run, there’s a decent chance he got a shot of you. And it’s always interesting to get a visitor’s take on our stunning Wenatchee Valley. 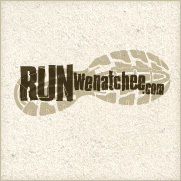 Steve Maher, a partner in RunWenatchee and AdventureWenatchee, is an avid runner and recreationalist. He also is a freelance magazine and online writer. Prior to joining RunWenatchee, he was an editor and reporter at The Wenatchee World. 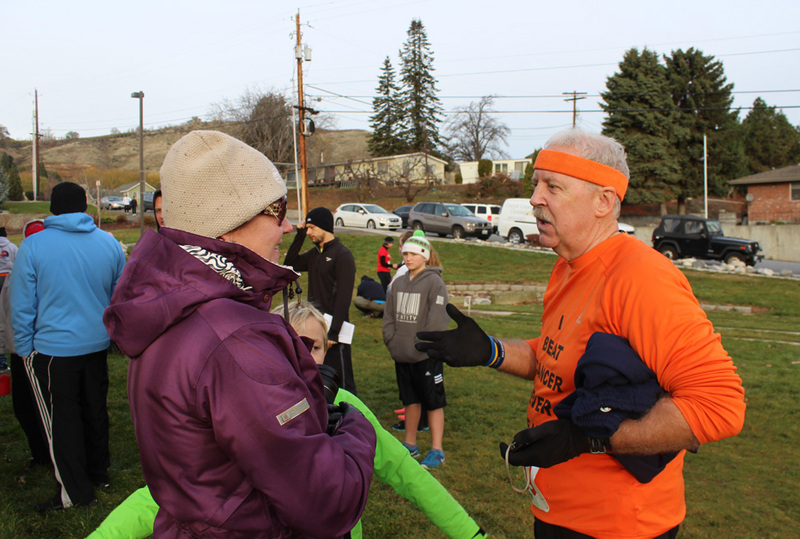 Scott Kabrich talks to a supporter prior to the start of Turkey on the Run in Wenatchee on Nov. 22.